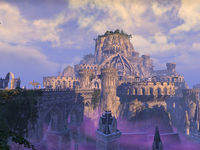 The city-state of Cloudrest is situated on the southern slopes of Eton Nir, overlooking the vineyards of central Summerset Isle. The path to Cloudrest is off the main road between Ebon Stadmont and the northern tip of the Oleander Coast, near the township of Rellenthil. Cloudrest is built in a valley, with a river flowing along the lower main street, working like a canal. The grand gate of Cloudrest leads into the lower district, which elevates, diverting north, and eventually goes around towards the Upper Level, where the Cloudrest Aerie is located. The Aerie is the base of operations for the Welkynar, who are sworn protectors of Summerset. It is ostensibly a seat of power, but it works primarily as a fortress, with ballistae and catapults along the wall. Cloudrest has a particularly odd style of architecture, a mixture of Strangler vine-esque buildings, atop of old ruins. Among these ruins are some made out of pure coral, which are speculated to be of Sload origin. This has led many to think that the Sload had inhabited the Summerset Isles, long before the Aldmer arrived from Aldmeris. There are several notable landmarks, such as the Baron's Maze, which consists of a confusing network of passages. A group called the Faculty of Chirurgeons operates out of Cloudrest, who are considered masters of face sculpting. Cloudrest is neighbored by several settlements, including Old Falls in the south, Karndar Watch in the east, and Kings Haven in the north. Little is known about the founding of Cloudrest, but it was likely built atop of pre-existing settlements that were either abandoned before Cloudrest's foundation, or were destroyed during the Aldmer's purge against the creatures of Summerset, as it was issued by Torinaan the Foresailor when he founded Firsthold. Cloudrest later came to prosper as one of the eight kingdoms of the Summerset Isles. As time went on, a group known as the Welkynars was founded, with Cloudrest as their base of operation. One of their most well-known members was Mornyalemar the Battle-Hardy, who despite his inept skill at using Magic, still proved to be a valiant warrior. But despite Cloudrest's prestigious history, there have been problems and complications in the Aerie of the Altmer. The Case of the Disloyal Canonreeve revolves around the Canonreeve of Cloudrest, who hails from a well-respected background, of an unparalleled lineage. But things would make a turn for the worse when the Canonreeve altered manifests and records of archeologist that researched the ruins in the city. His intent was too ship ancient relics to foreign investors, leaving no trace of missing items. He was eventually arrested by the Divine Prosecution. By 2E 580, the city-state of Cloudrest was brought into the Aldmeri Dominion, when Queen Ayrenn assumed the throne after the death of her father, Hidellith, having travelled the continent for several decades. Around 2E 583, the Welkynars, under the command of Relequen captured a Sea Sload named Z'Maja—a necromancer who was member of a group called the Abyssal Cabal, consisting of several Sea Sload that sought to sink all of Summerset. The Welkynar took Z'Maja to the Cloudrest Aerie, much to the dismay of the city's inhabitants. This proved to be their downfall when Z'Maja utilized dark magic to trap all of Cloudrest in a dense shroud of mist. The mist drained the life of the people, leaving the lower district completely intoxicated. The Divine Prosecution was forced to barricade the city until Z'Maja was dealt with, while Olorime of the Welkynar was able to keep a of people safe in the upper district. Olorime enlisted the help of a group of adventurers to defeat Z'Maja. And so, each of the Welkynars that had been corrupted by Z'Maja's magic were defeated, and the Sea Sload was slain. Olorime was the only one left of the Welkynars, and so she sought new initiates to continue the Order of the Welkynars. As of the Third Era, during the Interregnum, the city-state of Cloudrest was ruled by King Kelkemmenar. At the time, it was warring with the city-state of Firsthold on Auridon. ^ Events of "Woe of the Welkynars"
This page was last modified on 2 February 2019, at 18:19.